You can relax for now, knowing this pair is only a PE. 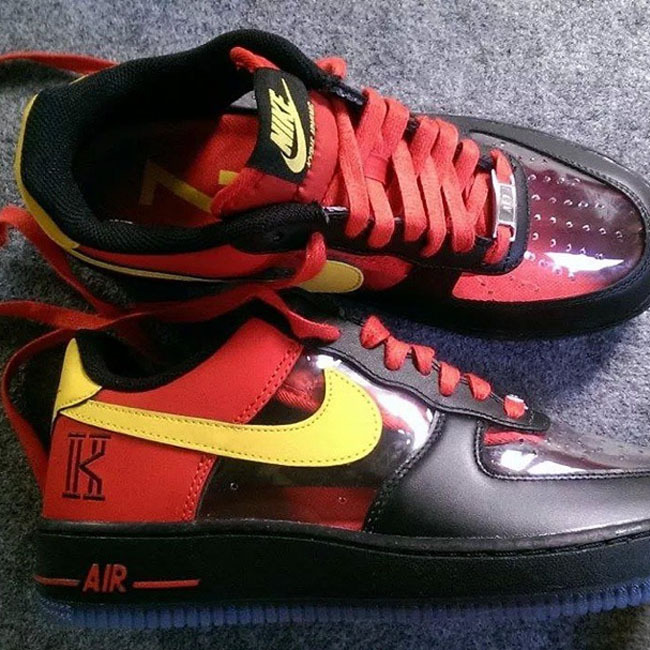 In 2004, Nike and ESPO collaborated to simultaneously create the most hyped Air Force 2 of all time, as well as what would become one of the worst trends of the decade, in clear-paneled sneakers. From there, we had 2006's "Invisible" AF1s and Clot-collaborative Air Max 1s, which helped the trend futher blow up. The next thing you knew, it became one of the most popular elements of fakes, even showing up on shoes like the Air Jordan 7 - for reasons we may never understand. So when a new clear AF1 popped up on TeeTun118's Instagram, "OH NO!" was the first reaction. But relax. These apparently are just a pair of PEs for Kyrie Irving. Could it signal a return to clear Forces though? Would you be interested in these if they were to release? We'll be on the lookout for a lasered pair next. UPDATE 11/5/14: The Nike Air Force 1 "Kyrie Irving" is releasing on November 15th.